Parallel-shaft helical servo gearmotors F..CMP..
High level of performance and an especially compact design: our F..CMP.. parallel-shaft helical servo gearmotors. They are ideally suited to all of your applications that require precision, dynamics and optimum use of space. Gearmotor: high power density and maximum power delivery for tight spaces. A lot of system architecture in materials handling and process engineering is reliant on especially compact drives. We offer you F..CMP.. parallel-shaft helical servo gearmotors for precisely these applications. The force, dynamics and high precision of this servo gearmotor with a space-saving design are impressive. At the same time, torques of 130 Nm to 7840 Nm can be implemented. Seven sizes from the CMP.. modular motor system are available to you for individually configurable CMP.. servomotors. The parallel-shaft helical gear unit of the F series is optimally designed for precise implementation of complex requirement profiles. The F..CMP.. parallel-shaft helical servo gearmotors ensure precise performance at all times, adapt perfectly to any system architecture and have a particularly high degree of efficiency. as the parallel-shaft helical servo gearmotors are designed in such a way that they require minimal space. 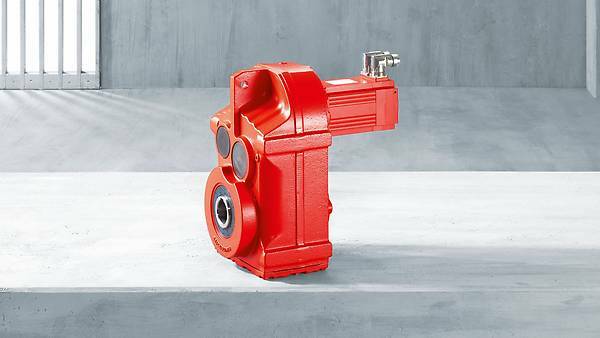 with a highly dynamic and accurately working servo gearmotor for demanding applications. thanks to a powerful and high torque solution with high efficiency.